It's that time again, and we've decided to open up the sugar house to you thanks to our selectmen who have passed an ordinance saying that we don't need a police detail! We will not be offering our famous elfresco breakfast, but, we will have plenty of syrup, nuts, candy, cotton candy and our "own maple ice cream available". Stop by anytime between 10-3:30, and don't forget wear your boots! Maple weekend is here again. Sweeet!!!! We have been working hard to bring you the freshest, finest maple products available for you. Back by popular demand, we will be offering an open house and welcoming you to our home. Come visit the farm and learn the process of making maple syrup. Join us for a delishous Al Fresco pancake breakfast which of course wouldn't be complete without our homemade maple syrup. Also available will be our famous maple ice cream, maple nuts, maple cotton candy (Bubba Gump Shrimp) maple cream, maple candy, and our own maple hot sauce. Visit the farm and meet our family! Nicholas raises chickens for eggs and meat. He will be available to answer any of you poultry questions. Nick will also have chickens hatching from eggs and available for sale. You might want to start your own flock! Caleb raises quail, he raises them for meat and eggs. You can place an orders with the boys for chickens, quails, turkeys and eggs while your here. 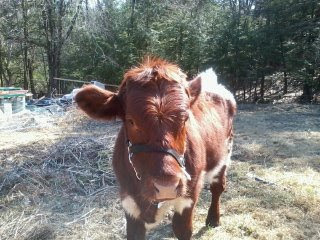 You will see how our girl Rosie has grown into a fine young cow! And I couldn't forget to tell you about Coco and Channel our sheep, our girls are soon going to be mothers. Meet Bob the proud dad to be! Have you kids bring a snack for Rosie and the sheep, they would love an apple or a carrot. The farm is located at 213 Ridge Road, in Northwood NH. We ask that you park at the Northwood Elemtary School, 511 First NH Turnpike, and take the shuttle bus that we will be providing to the farm. We will have someone there to greet you and driver to transport you. We look forward to seeing you March 23rd and 24th between the hours of 9am - 3pm! 2013 Maple Season is upon us! 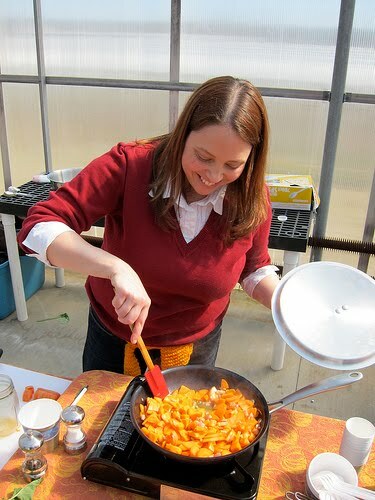 The 2013 Maple Season has begun with lots of Maple goodies available here on the farm. Maple weekend will be March 23 and 24th this year. Stay tuned for information on what we will be offering here on the farm! If your guessing what your Sugarmomma is having for easter well here it is! In a medium saucepan, combine the condensed milk, maple syrup, and salt. Cook over low heat, stirring constantly until mixture bubbles up, then cook, uncovered for 4 minutes, watching carefully to prevent scorching. Pour into the baked shell. Let cool completely, about 3 hours. in a chilled bowl, combine the cream, powdered sugar, and vanilla. Beat until stiff peaks form. Spread on cooled pie and top with pecans. Chill until ready to serve. Yippi!!! It's Maple weekend, and it seems to have come fast. 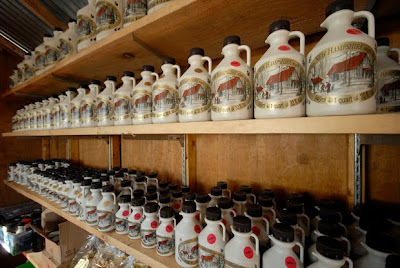 Visit us here on the farm and see how pure NH maple syrup is made. We have a few new additions to our farmily this year! Meet Rosie our 11 month old Pinzgaur, she is a beautiful duel purpose meat and milk cow, who will add to our sustainable life style. Once Rosie calf's we will then milk her to provide us will all of our dairy needs. We also will have the sheep, chickens, ducks, rabbits, and baby goats. 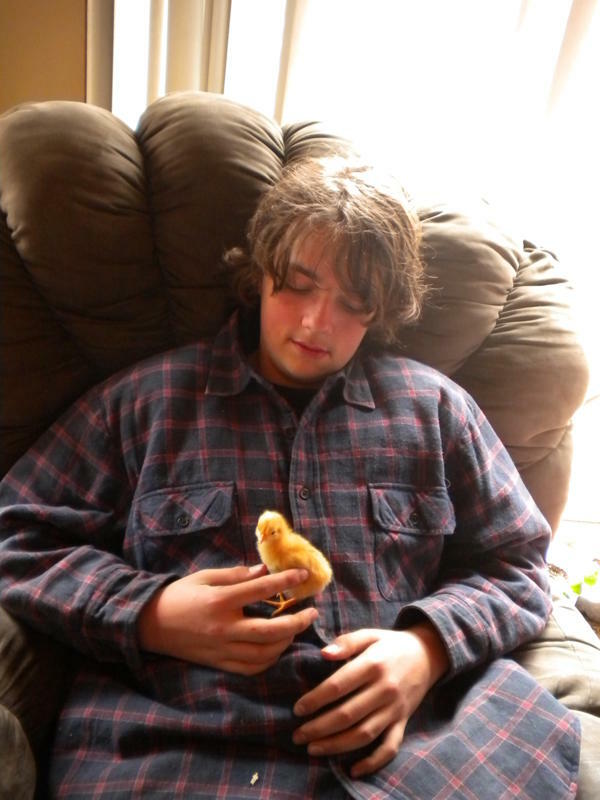 Nicholas will have a variety of baby chicks, bunnies and goats for sale, so that you can start your own flock! We will be offering a light lunch of hot dogs and drinks, and of course lunch wouldn't be complete without a creamy maple soft serve ice cream. Our shelves are stocked with syrup, candy, maple nuts, cotton candy and maple popcorn. Our hours for maple weekend will be from 9-3. Please drive safe and slowly!!!! The speed limit here is 25mph and strictly enforced. Chances are that if you're on the Sugarmomma's Maple Farm website, you know how good real maple syrup is. Like, so good you have a hard time picking your favorite grade 'cause they're all so delicious! But did you know that maple syrup is good for you, too? Pure maple syrup contains minerals (including potassium, calcium, magnesium, zinc, thiamine, and manganese), B-vitamins (niacin, pantothenic acid, riboflavin, folic acid, pyridoxine, and biotin), vitamin A, amino acids, antioxidant compounds, and anti-inflammatory compounds. Of these new finds, one that particularly stands out has been dubbed Quebecol (in honor of the Canadian province that leads maple syrup production worldwide). This compound is not present in maple sap and appears to be formed when the sap is boiled to make syrup. If you would like more opportunities to reap the benefits of real maple syrup, try using it for more than just topping pancakes, french toast, and waffles! Use it to sweeten coffee or tea, flavor vegetables or meat, or as a substitute for sugar in baking recipes. Add a few spoonsful of maple syrup to slow cooker recipe for pork, lamb, or beef. As the sugaring season winds down, don't fret; your Sugarmomma has lots of maple to go around. Come sample and purchase Sugarmomma's award-winning maple syrup and other products at Seacoast farmers' markets year round. The last two winter markets are this month, but summer markets start the first week of May in Exeter and Portsmouth! Belated Thanks for Great Open House! Ten days ago, Deb Locke and the Sugarmomma's Maple Farm family were breathing a [short] sigh of relief after a busy Open House Weekend. Saturday and Sunday, Deb worked in the sugar house (a.k.a. the Maple Day Spa, because of the steam sauna effect coming off of the evaporator). She boiled sap, as she had been doing for weeks already, all the while teaching visitors how maple syrup is made, from tree to table. 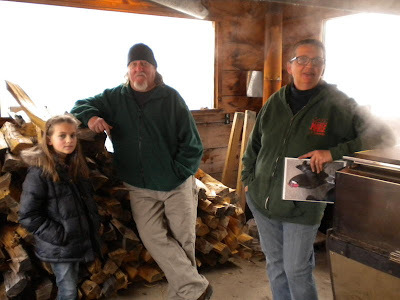 She typically shared a bit of maple history, demonstrated how she stokes the fire with pine logs (to keep it burning hot and fast) and keeps an eye on the temperature so the results are just right, and answered all manner of questions from visitors. Meanwhile, husband Ron worked primarily in the kitchen, making and serving delicious pancake breakfasts (and maple soft-serve ice cream) along with chef Ricky and helpers Davyanne, Ashley, and Vicki. Sons Nick, Wyatt, and Caleb introduced visitors to various critters on the farm, including pigs, turkeys, chickens, and quail--plus the new hatchlings and the visiting baby goats! Pam offered visitors "syrup tastings", describing the different grades of syrup so people could decide exactly which grade of syrup to take home. (In case you weren't there, the grade reflects color and flavor--not quality!--and is related to the sugar content of the sap that went into that batch. More on this later.) Joe sold all kinds of delicious homemade maple goodies from the store, including maple sugar candy, maple popcorn, maple cotton candy, spreadable maple cream, powdered maple sugar, four kinds of maple-coated nuts, and Sugarmomma's very special maple hot sauce. Ruthie and Vicki were the real troupers of the weekend, though, because they made bag after bag of maple cotton candy for the masses--and got covered in sticky bits of maple fluff! Numerous other friends and family pitched in to direct traffic, move tables, clear trash, and offer various other support over the weekend, and we couldn't have done it without their help. THANK YOU to everyone who made this special annual event possible! And "everyone" includes all of the visitors who came out to see the sugar house in action, learn how the Locke family is growing much of our own food, and support our farm. Without the support of our community, this business would not be viable. Thank you from the bottom of our hearts, and come see us again soon!